Cover artwork by David B. Mattingly. 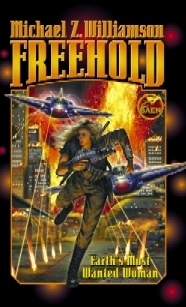 FREEHOLD was my first novel. It's not my best written; I've improved a lot in a decade. But, it struck a chord with a lot of people, and still sells quite well. A young soldier is framed for embezzlement and must flee a monolithic tyranny for a laissez-faire frontier. 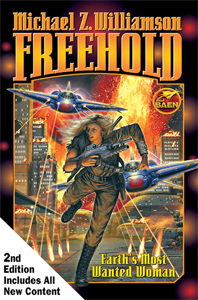 "Freehold" is now available online or as a free download through Baen's Free Library. Help yourself, and decide if you like my stuff enough to pay for it. The signed, limited edition hardcover is available for pre-order, and is due out on May 6th. Click the cover picture to view the Amazon page for ordering. Sergeant Kendra Pacelli is innocent, but that doesn't matter to the repressive government pursuing her. Mistakes might be made, but they are never acknowledged, especially when billions of embezzled dollars earned from illegal weapons sales are at stake. But where does one run when all Earth and most settled planets are under the aegis of one government? Answer: The Freehold of Grainne. There, one may seek asylum and build a new life in a society that doesn't track its residents every move, which is just what Pacelli has done. But now things are about to go royally to hell. Because Earth's government has found out where she is, and they want her back. Or dead. This all-new offering contains Michael Z. Williamson's brilliant novel Freehold plus three new stories along with a complete new novella - each set within the legendary Freehold series universe. Contains these additional stories: "Humans Call It Duty," "The Price," "Soft Casualty," and novella "The Brute Force Approach."